This entry was posted in postpartum depression and tagged Brown University, Laura Sockol, Postpartum Mood Disorders, research on May 29, 2013 by LHale. Join me tomorrow as Josh Becker from i simply am chats with us about the power of self-talk and being authentic in using your voice in reference to yourself. Go here to read his fabulous guest post. We’ll also be touching on this piece, “Selfish vs. Selfless: Conflicting Views of Motherhood and the Role of Self-Care—New Qualitative Data Emerges” from the fabulous Walker Karraa in reference to self-care for ourselves as mothers (and parents). It is beyond important as caregivers to the tiny humans (as Arizona on Grey’s calls them), to take care of ourselves. As I always say, self-care is not selfish, it is self-less as it allows us to fill our reservoirs so we are able to give more. If we are empty, we are unable to give to those around us. Tomorrow’s chat is going to be a wonderful lift of spirit, energy, and will start your weekend off right! So mark it on your calendar and pop in over on Twitter. 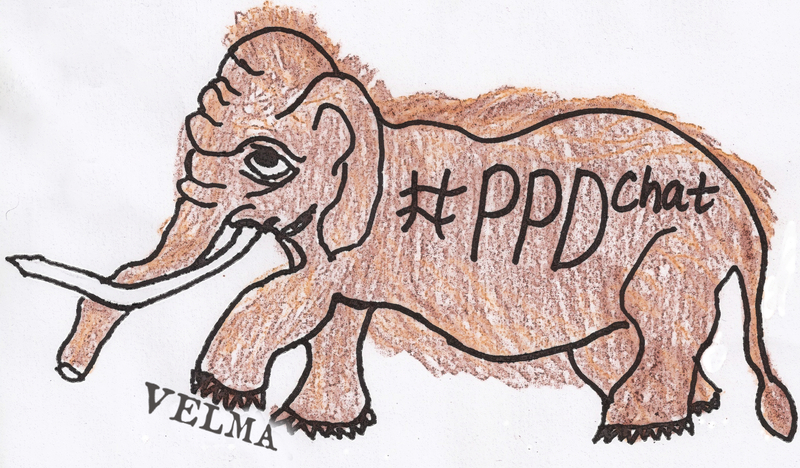 We’ll be using the #ppdchat hashtag. See you at 3:00 p.m. EDT! This entry was posted in #PPDChat and tagged #PPDChat, authenticity, Josh Becker, motherhood, mothering the mother, mothering yourself, self-talk, special chat, Walker Karraa on May 23, 2013 by LHale. During my time on Twitter, I have had the privilege to “meet” some absolutely amazing people. One of these amazing people is Josh Becker of i simply am. Josh’s spirit and his outlook on life is breathtaking. We graduated from knowing each other on Twitter to being friends on Facebook. Josh is one of those people every single one of us should have in our lives, a soul filled with light, gratitude, and ready to lift you up even when you don’t know you need it. His words have a way of speaking truth about whatever I’m going through right when I need to read them. He’s grown so much over the past years and I am beyond grateful to see him do so. 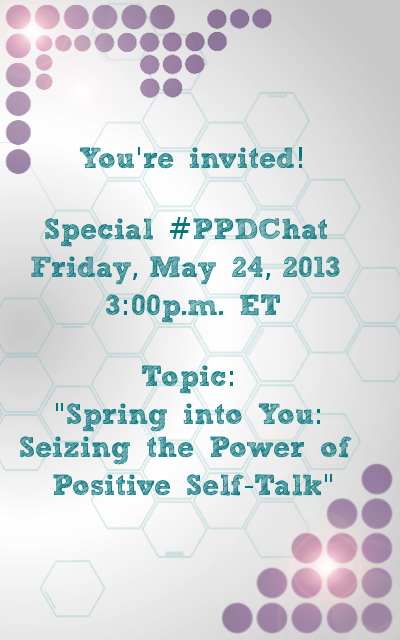 I’m even more thrilled to be sharing him with you this coming Friday afternoon at 3:00pm ET for a special #PPDChat. Josh and I will be discussing the importance of self-talk, about being your authentic self as you journey toward healing and life. I sincerely hope you will be able to join us because I guarantee this is a conversation you WON’T want to miss. Go follow him over @isimplyam and say hi! Below is a guest post from Josh, an intro, if you will, to the discussion we’ll be having on Friday afternoon. Read, comment, and share. And mark your calendar for 3:00pm ET Friday to dive into a live conversation! We were never given the permission to explore our own thoughts and feelings about life. We were usually told that something was good, bad, silly, stupid, smart, dumb, pretty, or ugly without any concern about what it meant to us. It didn’t take long from that impressionable age to know that to feel whole, loved, valuable, worthy, and important we had to go searching for it. Obviously these weren’t qualities we could identify and affirm in ourselves (so we believed). Our caregivers, and those closest to us, showed us these are qualities that you obtain after, and only after, you accomplish something. Even worse than having to “work” for your qualities, they would be judged first by them. The problem with this model is that these qualities, and many others, are Inherent. That means that you were born with them. You didn’t have to do anything to get these qualities nor could you do anything to have them go away. They were there and have been there your entire life. As we’ve seen though, this isn’t exactly what we were taught from a young age. We wound up mirroring what we learned from our caregivers. If we heard we were dumb, ugly, fat, slow, weak, unimportant, unworthy, or not enough in any way then that is what we knew. Even worse than knowing this, we came to believe it as truth. Our entire value system was taken from us and placed “out there”. That meant that we were drawn to those that affirmed us and turned off by those that didn’t. So much so that it was literally of no consequence how we valued ourselves. Esteeming ourselves came 100% from the outside world. The way we think and feel about ourselves has everything to do with how we treat ourselves (our bodies, our thoughts, our feelings, our minds, and our spirit) and everyone else. Yet, when is the last time you corrected yourself for saying any of the above? In fact, often times you’ll stand up for yourself if someone else calls you stupid but then turn around and joke about how dumb you are after making a mistake. If our goal in life is to become the fullest expression of who we are then we must change our starting place. Your starting place can’t be, “I’m dumb but sometimes I do smart things” or “I’m so ugly but once in awhile I can clean up nicely” or “I’m worthless so I’m going to take what I can get.” Making this your starting place forces you to express that which you think you are. If you really and truly think you’re dumb, ugly, not good enough, slow, weak, and unimportant then these are the exact qualities you’ll wind up expressing to the world. The difference between who we truly are and who we think we are is that the latter is what’s always expressed. I hope by now you see that you are not truly what other people think about you. You’re not truly even what YOU think about you. You are your inherent qualities that you were born with and you’ll always be those things. The question isn’t “Who Am I?”. We already know who you are. The question is, “How can I fully express my Authentic Self?” This begins with your self-love and that is expressed through your self-talk. As the Upanishads so beautifully pointed out, it starts with your thoughts but manifests in your destiny. You are Beautiful, Intelligent, Creative, Compassionate, Important, Precious, Strong, and Thoughtful. Guess what? There’s literally nothing you can do to change that! So stop trying, stop listening to others, and start reminding yourself what is true and express that truth. It’s in that expression that your dreams, your hopes, and your Authentic Life lives! What “I am” statement can you affirm right now? Even if it hurts to type it, let me know in the comments what the Authentic You looks like! Josh Becker is an author, speaker and mentor dedicated to helping you take off those glasses of false belief in exchange for your glasses of inherent nature. Josh is bridging the gap between the needed healing of our past and the tools necessary to live authentically now and in the future. You can find him at www.isimply.am, on Twitter, and on Facebook. This entry was posted in #PPDChat and tagged #PPDChat, authenticity, i simply am, Josh Becker, self-care, self-talk, Twitter Chat on May 22, 2013 by LHale. As I have addressed recently on the blog, facing challenges with your baby in addition to a Postpartum Mood and Anxiety Disorder is hell. Today, we’re talking about those struggles with a specific focus on the challenges of being a NICU mom during the 8:30pm ET session. Joining me for that session will be @notjustaboutwee, a fellow NICU veteran, and co-administrator of the closed FB group for #PPDChat. I hope you’ll join us as we discuss the challenging road that is a Postpartum Mood Disorder along with the struggles of being a special needs mom. See you there! 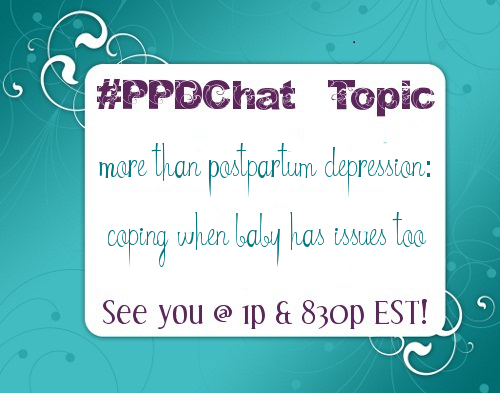 This entry was posted in #PPDChat and tagged #PPDChat, coping methods, motherhood, NICU, Special Needs Parent on May 20, 2013 by LHale. 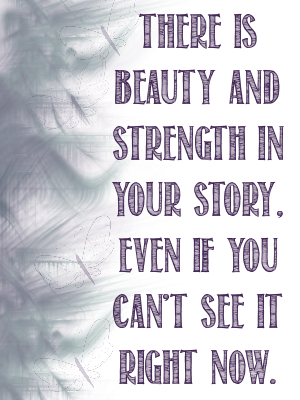 This entry was posted in postpartum depression and tagged #PPDChat voices, advocate, Postpartum Mood Disorders, Postpartum Voice of the Week, strength, survivor, video on May 16, 2013 by LHale. Today is the APA’s Annual Mental Health Blog Day. I’m diving into an aspect of Postpartum Mood & Anxiety Disorders which is often swept under the rug yet brings with it a very divisive and stigmatizing aspect to the birthing world. I dove into this topic somewhat with a blog post just a week ago, but today I’m diving in even further because beneath the exposure of THAT post, there is even more stigma and non-discussion going on among some of the largest birth support organizations (Lamaze, DONA, and CAPPA) in regard to Postpartum Mood & Anxiety Disorders. If you read the post linked in the above intro paragraph, you’ll read that Henci Goer’s view of Postpartum Mood and Anxiety Disorders places the blame for experiencing them on the breakdown of the system of medical intrusions into the birthing experience. If we could just fix the system, she believes, Postpartum Mood & Anxiety Disorders (which are all PTSD related to intrusive medical occurrences during birth, by the way), would disappear and every single mother would be just fine. Only it doesn’t work that way. We could have the most perfect birth in the world and still end up with some form of a Postpartum Mood & Anxiety Disorder. I’ve talked to mothers who have had this happen to them. Do the intrusions add to the potential? Sure. It’s a risk. Know what else is a risk? Being female and being pregnant. Researcher after researcher has proven that while yes, there are actions we can take to alleviate our risks or shorten our experiences, we are ALL at risk regardless of our stature in life or the manner in which we give birth. From those at the highest of society (Kim Kardashian, anyone?) to a woman in a third world country with the most meager access to care, we are ALL at risk. Different language may be used to express those experiences, but going “mad” after childbirth is something which has occurred since the time of Hippocrates and doesn’t show any signs of slowing down. I’m not saying that we are all DOOMED to experience Postpartum Mood & Anxiety Disorders, absolutely not. I’m saying that our risk factors are similar. Additional stress adds to our risk weight but beyond that, pregnancy itself is a risk factor as it does things to our bodies, to our hormones, to ourselves, that we will never fully understand regardless of how much research we do. The best way, I think, to approach pregnancy, is to advocate for the best care for yourself, whatever that may be. If you need an epidural to give birth, then go for it. If you want to give birth naturally, go for it. But be aware that birth is a fluid and organic process over which we truly have no control. Things may happen for which we are either not prepared or not willing to have happen. However, if you’re open to the possibility that they *may* happen, the result may be less traumatic and therefore leave a shorter impression upon your psyche. In reading through Lamaze’s Listening to Mothers III report, I’m hit with some thoughts about how well the birth community IS listening to mothers. So I decided to go hit some of the other websites to see where they stand on Postpartum Depression Mood & Anxiety Disorders. How well do they prepare Mothers for the possibility of these issues and/or how well do they welcome mothers who have birthed before and experienced these things and are now searching for a “better” way to birth in order to avoid similar issues? The answers were not good. Not only do they recommend screening, they recommend development of a referral process AND note that women with current depression or a history thereof should be monitored. Kudos, ACOG. DONA also offers up a Postpartum Plan worksheet for new mothers. Nowhere on this sheet does it at all mention what to do if a Postpartum Mood & Anxiety Disorder appears. To DONA’s credit, however, there are books included on their required reading list for their Postpartum Doula Certification by known Postpartum Mood & Anxiety Disorder experts. The books, however, are older, and the PDF for Postpartum Doulas has not been updated since 2009 while the list for the Birth Doulas was last updated in 2013. CAPPA’s position paper for Postpartum Doulas makes mention of Postpartum Depression and focuses on the “fourth trimester” as one which must be traversed as carefully as the three trimesters of pregnancy. The Postpartum Doula, according to CAPPA, is not to provide medical care, but to have a network of caregivers (none of which are therapists, psychologists, or psychiatrists) which they can refer the family to if so needed. Makes sense, yes? After all, we do need to be mothered after giving birth. We know how difficult it is to make that adjustment to having the baby on the outside instead of on the inside. The reading list for the Postpartum Doula at CAPPA has only three Postpartum Mood & Anxiety Disorders books listed, two less than DONA. The Childbirth Educator certification list has NO books regarding Postpartum Mood & Anxiety Disorders. In discussion with various OB’s, I’m told they spend less than 2 weeks on Postpartum Mood & Anxiety Disorders as they train for their specialty. Two weeks to understand the complexities of Psychiatric issues post-birth. 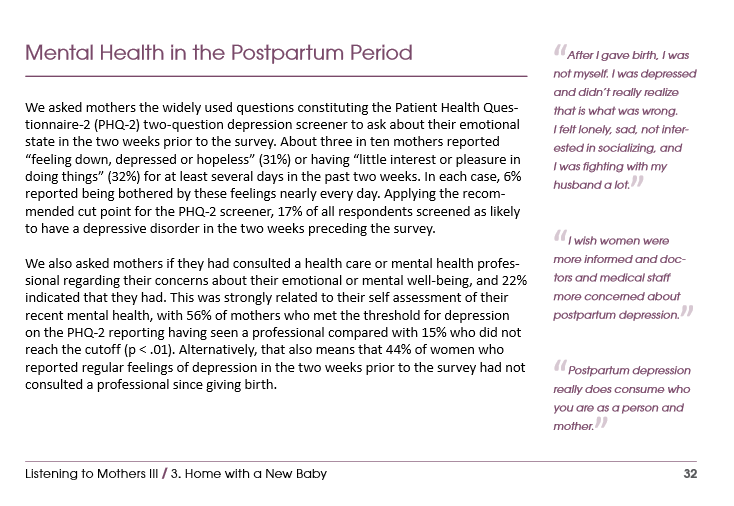 I don’t know what’s more disturbing here – that 31% of the mothers were self-reporting as feeling down or depressed or that 44% of these women with regular feelings of depression in the two weeks prior to the survey HAD NOT CONSULTED A PROFESSIONAL SINCE GIVING BIRTH. HINDERING MOTHERS FROM SEEKING HELP?!?!? There are the standard reasons, of course, lack of insurance (due to Medicaid), cost, transportation, childcare, stigma/denial from family members, etc. I’m pleading with the caregiving community as a whole – with Obstetricians, with midwives, with pediatricians, with doulas, with anyone and everyone who may come in contact within a medical capacity with a pregnant or new mom to accept what she has to say as truth. To not try to reframe it for her, to not brush it off, to not dismiss her very valid fears and concerns. Listen. Truly listen. Don’t run through all your evidence based research in your head as she’s pouring out her heart to you – because if she’s doing that, it took her a very long hard look inside to be able to do that and if you say the wrong thing, you’re going to shut her down very quickly and do harm to her recovery process. For those who DO listen, who do educate themselves and go beyond the certification recommendations, thank you. Thank you for bringing awareness to this struggle that so many of us fight. With every birth, a new mother is born. It does not matter if she’s been born into the role before, she is reborn with each child. For each child and each aftermath presents a different set of challenges with which she must learn to live. Be gentle. Be kind. Be supportive. Listen. Don’t shame. Don’t stigmatize. The trust of a new mother is an amazing thing. Stop abusing it, stop re-framing it, and above all else, wrap it in love and return it with your own level of compassionate honesty. We, the women of the world, the mothers of all of you, deserve at least that much. This entry was posted in #PPDChat, Blog Day and tagged ACOG, APA Annual Mental Health Blog Day, CAPPA, DONA, doula, Lamaze, Lamaze Science & Sensibility, Postpartum Mood & Anxiety Disorders on May 15, 2013 by LHale. Mother’s Day isn’t an easy day for many of us. Today’s chat focuses on the difficulty of celebrating Mother’s Day when Motherhood isn’t quite what you expected. Join in as we talk about our Mother’s Day experiences and any challenges that came along with yesterday’s events. See you on Twitter! This entry was posted in #PPDChat and tagged #PPDChat, Mother's Day 2013 on May 13, 2013 by LHale. We all have them – the rough parenting days where nothing seems to go right. We woke up to screaming, grumpy, unhappy infants, we can’t make the coffee fast enough, things that can go wrong ARE going wrong and OMG I JUST NEED TO HIT THE PAUSE BUTTON BECAUSE…. The days that we would LOVE to blog about (and some of us have) but some of us are not quite sure how to phrase things to ensure that it doesn’t seem that we’re ungrateful for our little ones although they’re driving us off the cliffs of insanity at the moment. How do we balance the fine art of discharging our frustrations about the difficult stuff and still seeming to be grateful for the amazing little creatures with whom we have been blessed? That’s what today’s topic focuses on – the challenges of discussing the parenting struggles -honestly- without seeming to be ungrateful for the joy that goes along with these struggles. Join us at 1pm ET and 830pm ET on Twitter. 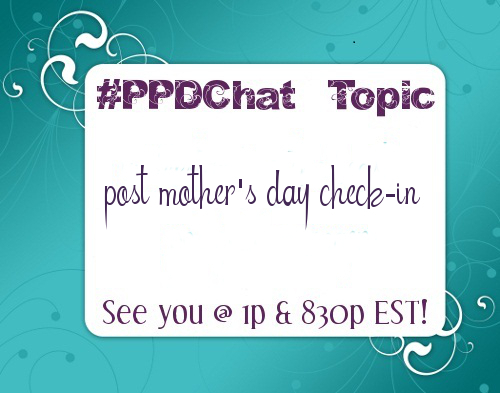 Follow using the hashtag #PPDChat. Look forward to seeing you there! 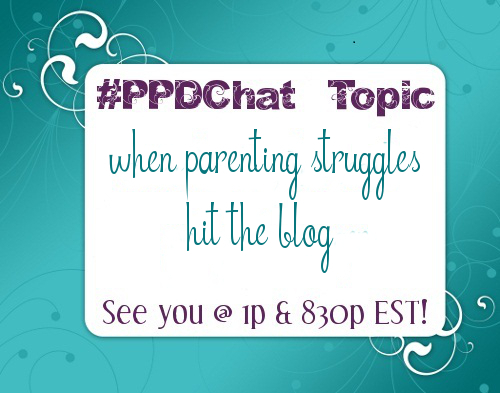 This entry was posted in #PPDChat, blogger and tagged #PPDChat, blogging, parenting struggles on May 6, 2013 by LHale.